Nothing much except the view but you could always walk to the park for the view. 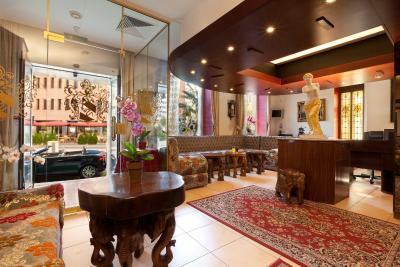 Gracious hotel, wonderful location, helpful staff. The location was perfect, great views of the lake. This hotel had beautiful view of the lake just across the street from the water. The hotel is a bit outdated. The breakfast spread was very delicious with a view of the lake. 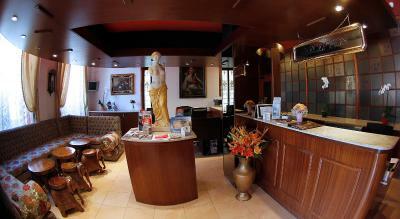 The receptionist called Gaetano is friendly and helpful guy. I will come back to the hotel again because of him. 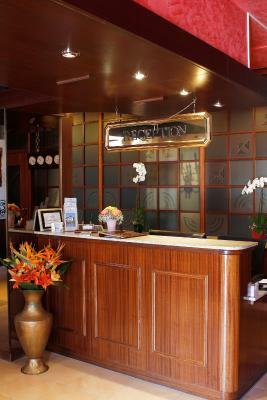 The hotel is charming with friendly staff and a great location. The breakfast is great. Beautiful view! 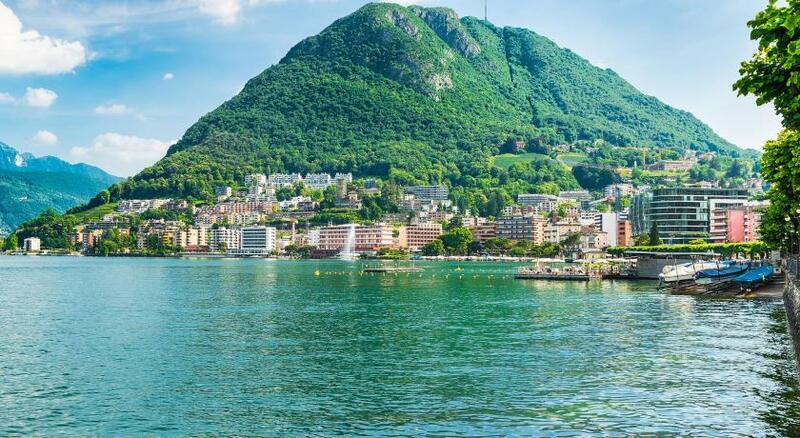 Laco Lugano is stunning. Drive down to Mercote too. 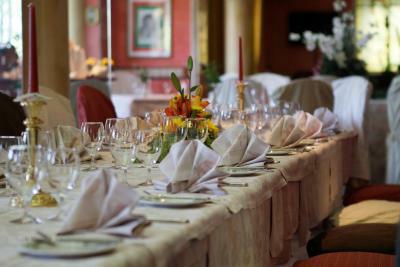 I loved the location, the room, the air conditioning worked wonderfully, the breakfast was fantastic- yes I heard the complaints about no fruit but really the bacon was great, the scrambled eggs perfect and the pastry and cheese and meats where great. Also the complaints about the breakfast room - there are inside and outside seating. Yes a sparrow flew in but the waitress kept up with shooing it outside. It just wanted some of the great food. It added to the ambiance of the place! The pillows where fine - if you wanted the pillow to be thicker all you have to do is fold it in half. No noise except for the road traffic which you will have in a city. It was a great place! The facility s located very well, right across from the lake and walk-able to the main part of town. The facility itself is in need of immediate renovation and refreshing. I would definitely recommend lake view rooms. 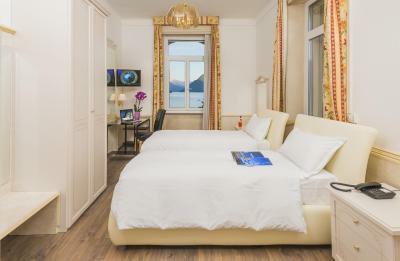 One of our top picks in Lugano.Built in 1884, Hotel Victoria in Lugano-Paradiso stands right on the shore of Lake Lugano and offers panoramic views over the bay and of Mount Bre. 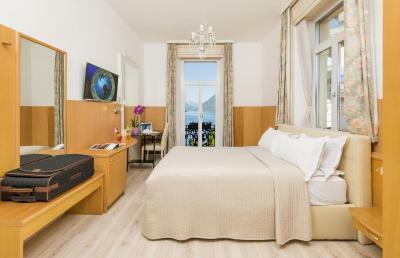 All rooms were completely renovated in 2015 and come with a mini-bar, a flat-screen TV and free WiFi. 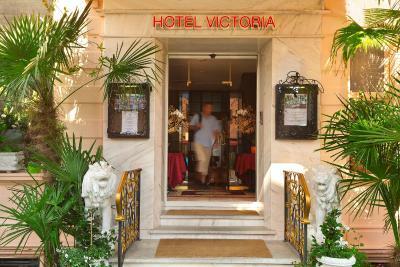 There are 2 reasonably-priced restaurants/pizzerias on site, offering views of the lake and of the palm tree-lined avenue in front of Hotel Victoria. 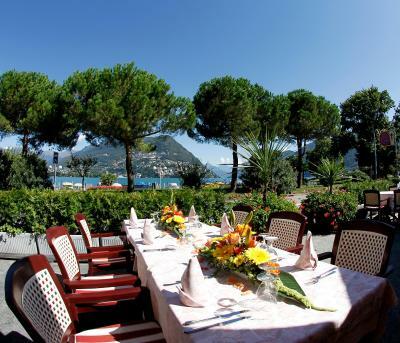 During summer you can dine outside on the charming terrace. The well-known Dancing Club Cecil is also located on site and offers live music on weekends. It is completely soundproofed. 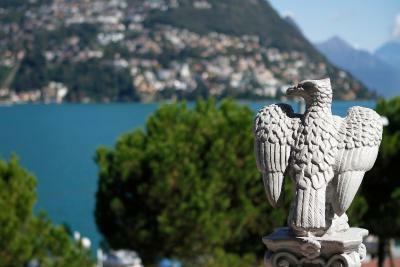 A short walk away, you can find a bank, a hairdresser, a public swimming pool and the funicular up the San Salvatore Mountain. Public parking on the roads is free of charge in the evenings and during the night. A public car park is available for a fee in the immediate vicinity. 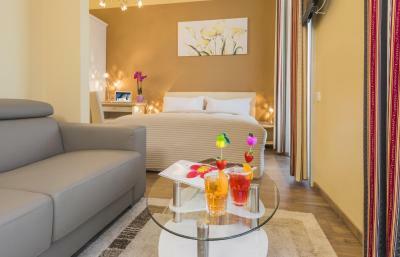 Air-conditioned room with a flat-screen satellite TV, a mini-bar, and a bathroom. 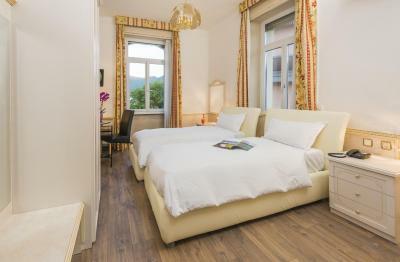 Air-conditioned room with a flat-screen satellite TV, a minibar, and a bathroom, offering panoramic views of the entire bay of Lugano. 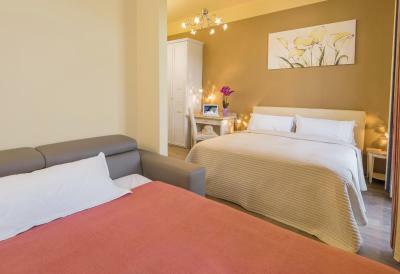 This twin room features a mini-bar, air conditioning and satellite TV. A bit dated but that's part of the Victorian charm. 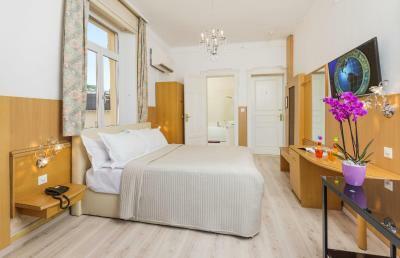 Spacious room, great windows, lots of sunshine, breezy, large bathroom with tub, private, friendly staff, free wifi, free breakfast, across from the lake, perfect location to walk everywhere, etc. 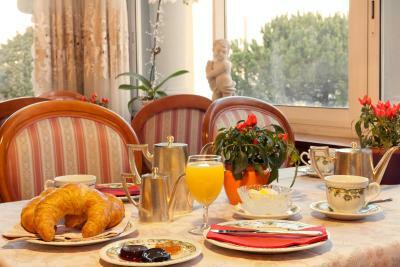 Be at breakfast really early, otherwise there will be very few things left. Unfortunately the food gets not replenished, so... Only 1 waiter for the entire dining room, so sometimes there's no one around when you need help or want to order something. Although food is fresh and coffee is nice, I'd expect more choice and more replenishment for the price I paid! Also, renovating the facilities would be highly recommended. Strangely enough, there was a nasty smell of cigarettes throughout the hotel, which especially in the dining room was not pleasant. Please make sure this doesn't happen. I really liked the nice location and the lake view from our room. The mattress was really comfortable, although the bed was relatively small, I believe 160 cm wide. When your partner is almost 2m tall, it's quite a stretch :) The hotel has a nice oldfashioned flair to it, but unfortunately this is not taken care of enough, so instead of being really really cute, it looks a bit old and dirty. Such a pity! 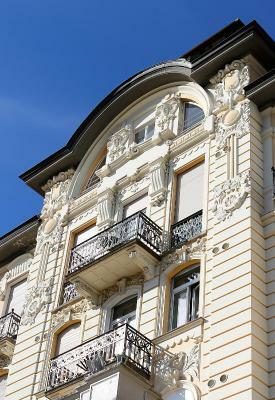 With a bit of renovation works, this could really be a gem! Great location - right on the lakefront. 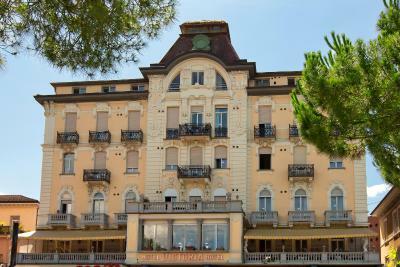 We had a very nice room, with a big central terrace in front of the lake. Really nice. Staff could have been a bit more enthusiastic. Had to pay 20chf per day parking. No access through hotel to get to the restaurant for evening meal. You have to take a short walk outside round the back but the lake view is at the back anyway. 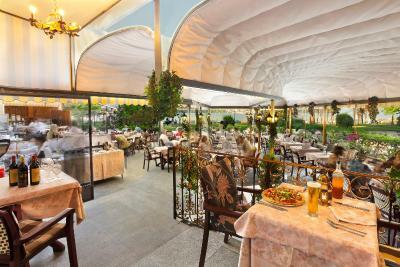 Restaurant has only a conservatory which can be cold early Spring even with heaters on or a choice of sitting outside under the awnings. Food excellent but expensive by Uk standards. Visited in early April. 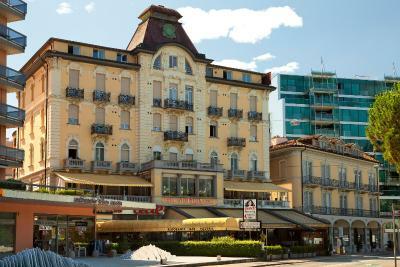 Very well kept period hotel. Nice decor throughout. Bed and room very comfy. One of the few hotel rooms with proper central heating that works. 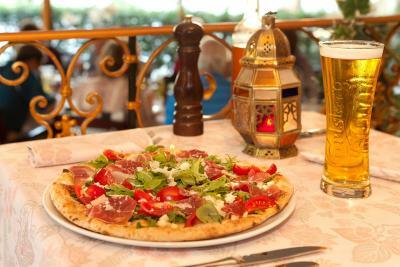 Excellent evening meal in hotels own restaurant on ground floor. 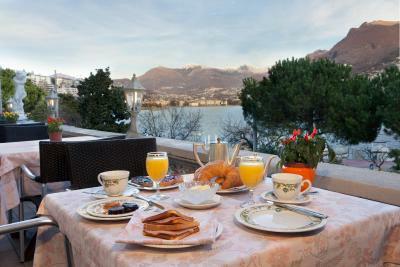 Breakfast is served on first floor and has great view of Lake Lugano. This hotel has a NIGHT-CLUB in the hotel, which means that every evening there is loud music with thumping vibrations the whole night. Breakfast: okay, we are talking about a 3 star hotel, but seriously cold filter coffee was served in the morning?? Stale, dry, warmed-up bread!! NO coffee machine for clients. Breakfast selection is seriously lacking. The rooms are old. The door of the room does not close properly, leaving a huge gap. At night light pours in. The bathrooms are spacious, but just not functional. We were there for a weekend and could not even shower, because the shower head was not properly cleaned, resulting in water spraying over the entire bathroom. Basically there was no shower, just a bath!! The parking COSTS CHF 20 per night. 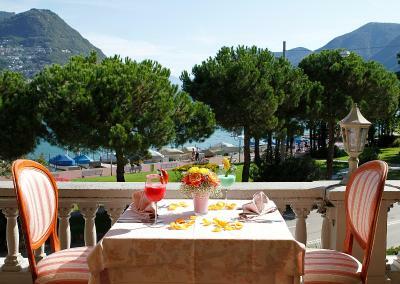 Great location in front of the lake!!! Worth to stay there! Clean and comfortable! In the room it smelled very bad, probably from the sewer. Very nice please and the lady on reception was super kind and she gave super service!! Because of her i will come back! Customer service is very important! In the night it smells like sigarette smoke in my room. From the club below And you Can hear a bit the music. Location And the view on the lake. The hotel is need to of a refresh....very dated, but in perfect working order. The bar and restaurant were not open as it was out out of season. The setting. The views of the lake and mountains were fabulous.